The one where I make chicken quesadillas because I am a busy mom juggling a bunch of stuff, and need a quick meal because I am fit and healthy and spend all my time at the gym, but in reality, I was just lazy that night. Okay, I’m not gonna lie. I am a Zumba addict. I try to go to Zumba class at the YMCA every single time it is offered. And sometimes that is in the evening, which totally screws up my dinner-time routine. The kids love it of course, because the chance of getting Mickey-D’s is a thousand times better for them on those evenings, when I’m sweaty and exhausted and there is still homework and baths to give. But I rarely eat fast-food, so on those rare occasions when the little foodies get to go to the golden arches, it still leaves me and the Mr. in a supper-time bind. So I like to plan a quick meal ahead of time that I can throw together in a matter of minutes. AND it’s also kid tested and approved if ya wanna drive right past McNot-Today’s. Just sayin’. 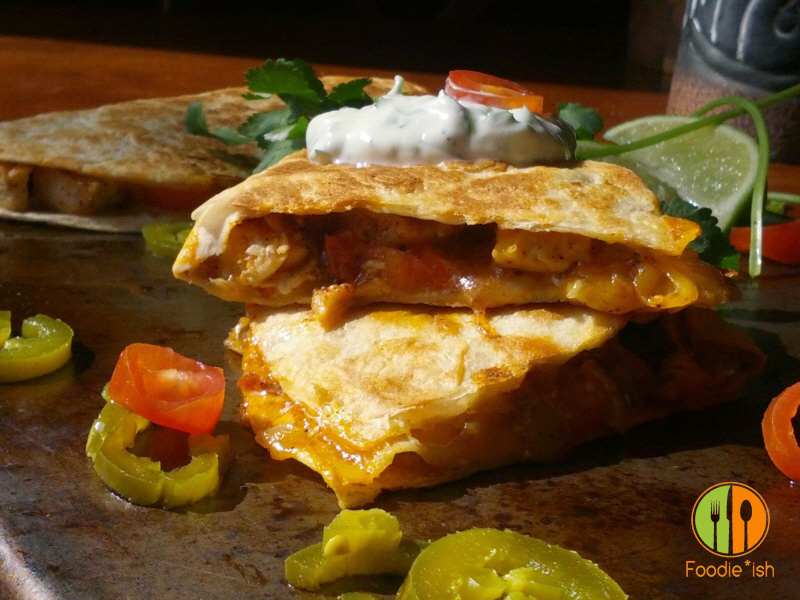 Often that meal is some version of quesadillas. 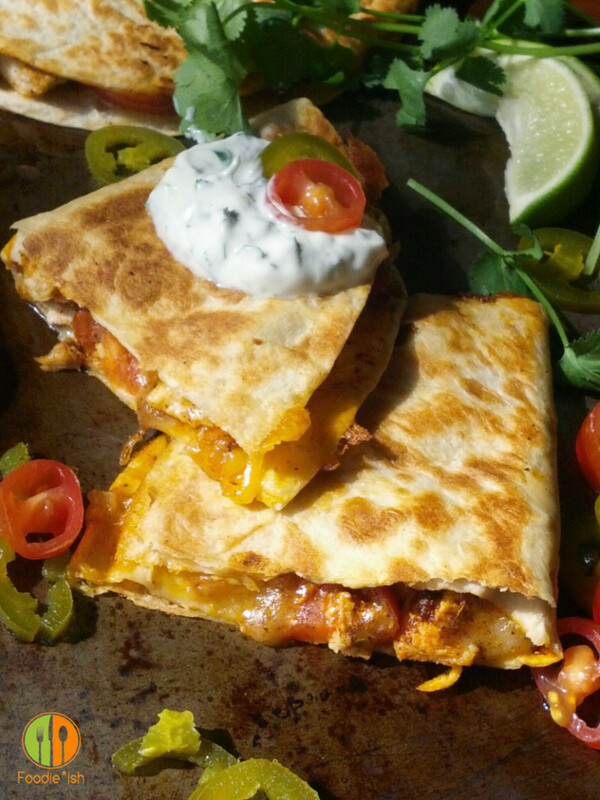 like these Easy, CHEESY chicken quesadillas! There is never enough cheese in anything. Ever. Hence my addiction to Zumba. 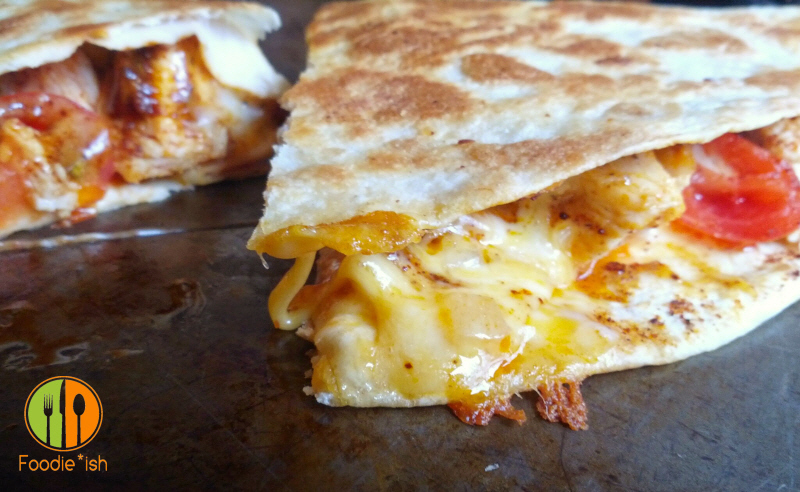 Oh sweet cheesy goodness… you look MAAAVELOUS! Get in my Belly!!! Whenever I make sauteed chicken breasts (for Chicken Bacon Ranch Ciabatta Bread Sammies, or Cajun Chicken Pizza), I always make one or two extra. They always get eaten and they are a God-send when I’m feeling a bit lazy or rushed. 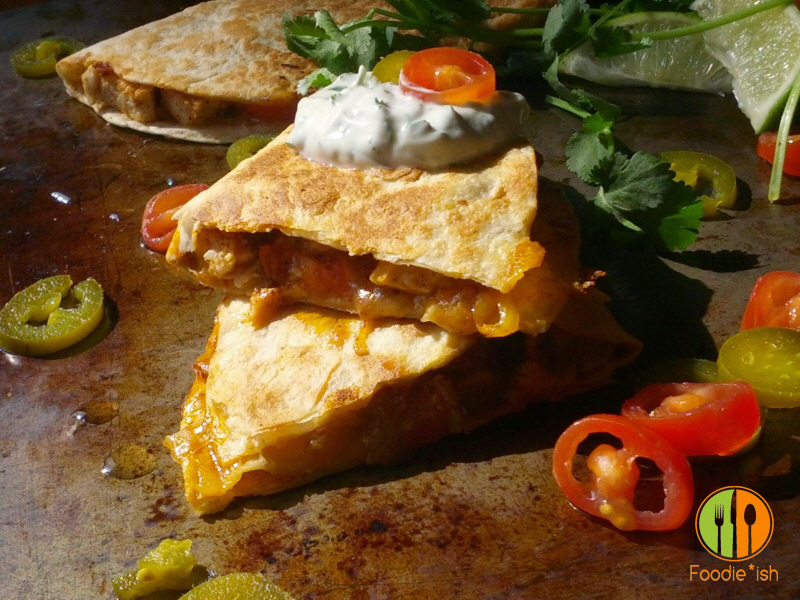 And if you’ve got one or two already cooked in the fridge, this cheesy chicken quesadilla recipe seriously takes almost no time at all. Perfect for Zumba night 😉 And If you don’t happen to have left-over cooked chicken, pop into the grocery on your way home from work and grab a fully-cooked rotisserie chicken, cut up the meat and Bam! Done! 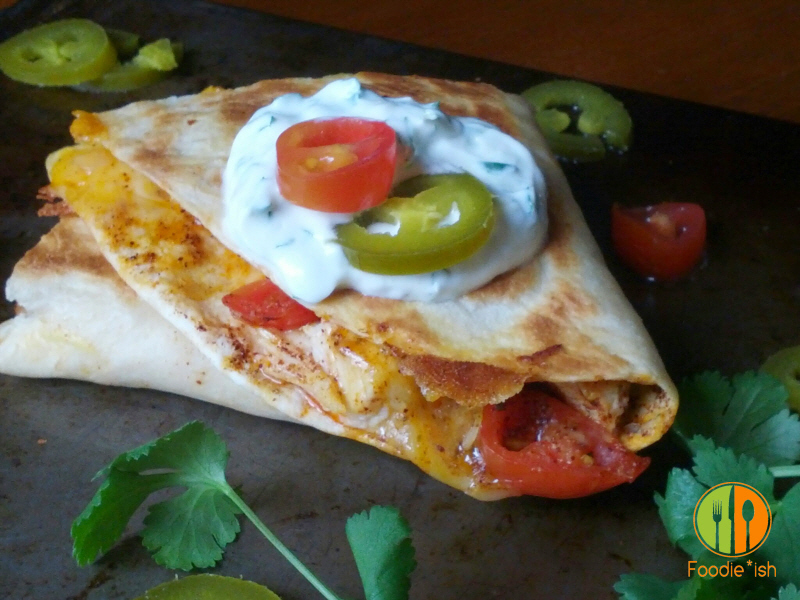 Now, I don’t want you to think these cheesy chicken quesadillas are only worthy of a quick, rushed weeknight meal. I mean… no one knows how little effort you put in. 😉 If you’ve got a little more time to prep and cook, pair them with some Spanish Rice, super decadent (but also a super-food) guacamole, and or some homemade salsa to make a truly Foodie*ish meal your friends and family will want to linger over. Oh cheesy McYumminess… Down in to my belly!!! Combine chili powder, oregano, garlic powder, paprika, cumin, salt and pepper and cayenne (if using) in a small bowl, and set aside. 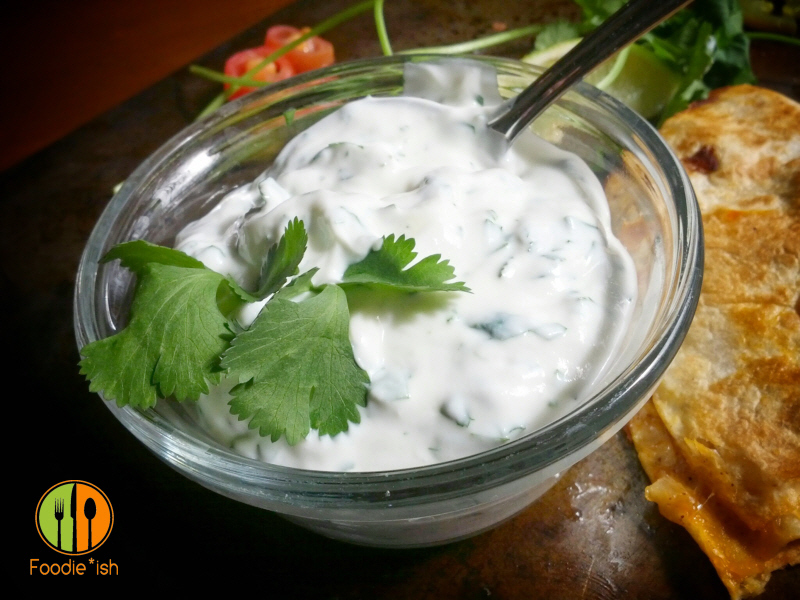 Combine sour cream, cilantro, and lime juice in a small bowl and refrigerate until ready to use. Melt butter in a small saucepan over medium heat and add chopped onion. Cook until translucent and slightly starting to brown (about 7 minutes). Lay a tortilla on a work surface and cover with 1/4 of the shredded cheese. Top the lower half of the tortilla with 1/4 of the diced chicken, and layer with 1/4 of the cooked onion. Top with 1/4 of the sliced tomatoes. Sprinkle about 1/4 of your seasoning all over the meat and tomato half. 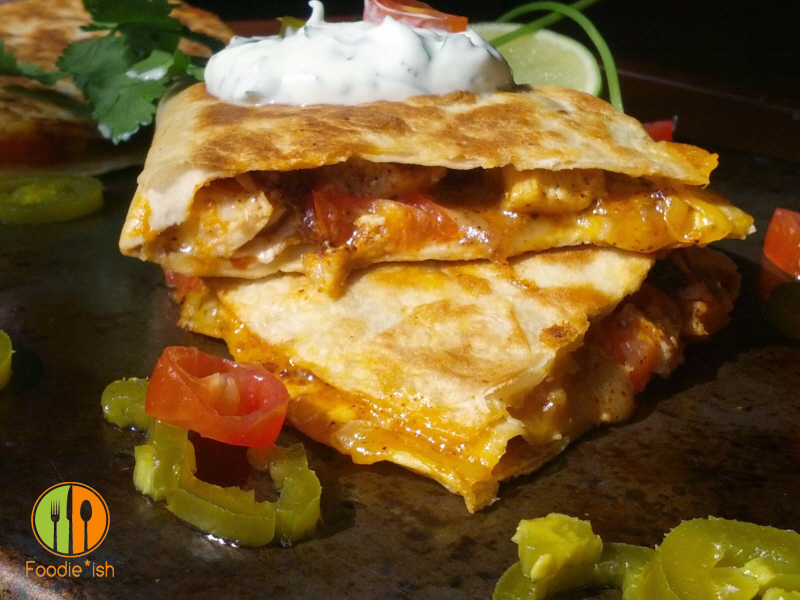 Carefully fold the top half of the tortilla over the chicken, and tuck any straggling cheese or chicken back inside. Spray the top with non-stick cooking spray (or oil from a oil sprayer). Heat a non-stick skillet over medium heat. Gently, using a wide spatula, lift your quesadilla off the work-surface, and carefully flip it, oil-side down into the pan. Nudge any straggler stuffing bits back inside. Cook for 4-6 minutes per side, or until golden brown and the cheese is melted. *If your pan is large enough, do two at a time to save time. Once quesadillas are cooked, cut each into halves and serve two halves per plate. Top with a dollap of cilantro-lime sour cream and serve. Oh, and if you are looking for a good, large non-stick skillet (big enough to cook two easy cheesy chicken quesadillas, you say? ), I absolutely LOVE mine. It’s called a Green Earth skillet from Ozeri. It’s awesome because it uses a PTFE and PFOA free ceramic coating. And seriously, if you haven’t moved over from the old Teflon stuff, DO IT! Ceramic is SO much more durable, and is way safer. And ceramic-coated pans are typically much heavier than the oldies were, which means they cook more evenly (at least in my experience they do). This bad boy gets used all the time in the Foodie*ish kitchen, and is still in awesome shape, so it’s a winner as far as I’m concerned. If you click the link above and purchase, I will receive a small percentage of the sale price (and it doesn’t affect your cost whatsoever). Thanks for your support!